The Salvation Army Ray and Joan Kroc Corps Community Center indoor aquatic facility is designed to provide fun for all ages. In addition to the recreation pool and lap pool, the aquatic facility offers a fun water play area with a water slide for the whole family that encourages multi-generational interaction. The recreation pool is a zero depth entry pool and children will enjoy attractions such as the Jumbo Shrimp slide, Splashpads, and vertical sprays in designated areas. The lap pool is used for water skills classes, swim class, aqua aerobics classes and more. The recreation pool also offers a family water slide with a catch pool. The Kroc Center offers a variety of swim lessons for all ages and skill levels. During the summer season, due to the amount of traffic in the pool, Swim Lessons will be on hold until fall. All lessons are nonrefundable. We do not offer makeup classes, plan your schedule accordingly. Enjoy all the benefits of a land workout without the impact on your joints while improving cardiovascular fitness, muscular strength and flexibility. Various types of equipment will be introduced as participants work at their own pace to advance their skills. All swimming levels welcome, ages 13+. Expect to get a great workout! No matter where you start you will finish strong! Learning to swim is an important skill that children will keep with them for life. At The Salvation Army Kroc Center, we take special care to make sure our swim lessons are comforting, welcoming and inviting for children as young as six months. We offer classes for infants, toddlers, children, and adults. With never more than six people per class, this intimate swim instruction provides a great environment for children learning to swim. Our swim lessons give children a platform to grow and develop their swimming skills as they become proficient at each level. At your child’s first swim class, we will assess their swimming proficiency and provide lessons for their specific skill level. To advance from one level to the next participants must demonstrate the exit skills required and have Aquatics Coordinator approval. All lessons are based on instructor availability. We do not offer makeup lessons for any missed classes. We strictly enforce our cancellation policy. No cancellations allowed within 7 days of the start of a new session. We love to swim, and our goal is to help children love it, too, through fun and educational swim lessons! During Swim Lesson times parents are invited to sit in the viewing area, just outside the pool on the other side of the glass, where you may view the lessons. Private lessons are offered for students who prefer a one on one experience. These lessons can be scheduled at the convenience of the student and if the aquatics area can accommodate that time. Private lessons available for members and potential members. Call the Aquatics Department at 228-374-9129 to schedule private lessons. The Private Swim Lesson package includes 8 half hour sessions. With never more than six people per class, this intimate swim instruction provides a great environment for children learning to swim. At your child’s first swim class, we will assess their swimming proficiency and provide lessons for their specific skill level. Group Lessons: $55 per session for members / $75 per session for potential members. Sessions last a total of eight classes. If a parent would like to attend Parent/Child lessons two times a week, the regular group rate applies. This class is designed to be completed in a two-week session and each class is 30 minutes. The class is designed to teach students basic water safety as well as beginner swimming technique (ex: back float front float, basic flutter kicks, blowing bubbles, front glide 3 feet, jump in and return to the wall). This class is designed to be completed in a two-week session and each class is 30 minutes. The class is designed to teach students basic water safety as well as beginner swimming technique (ex: back float front float, basic flutter kicks, blowing bubbles, front glide 3 feet, jump in and return to the wall, and tread water). This class is offered in two-week sessions and each class 30 minutes long. 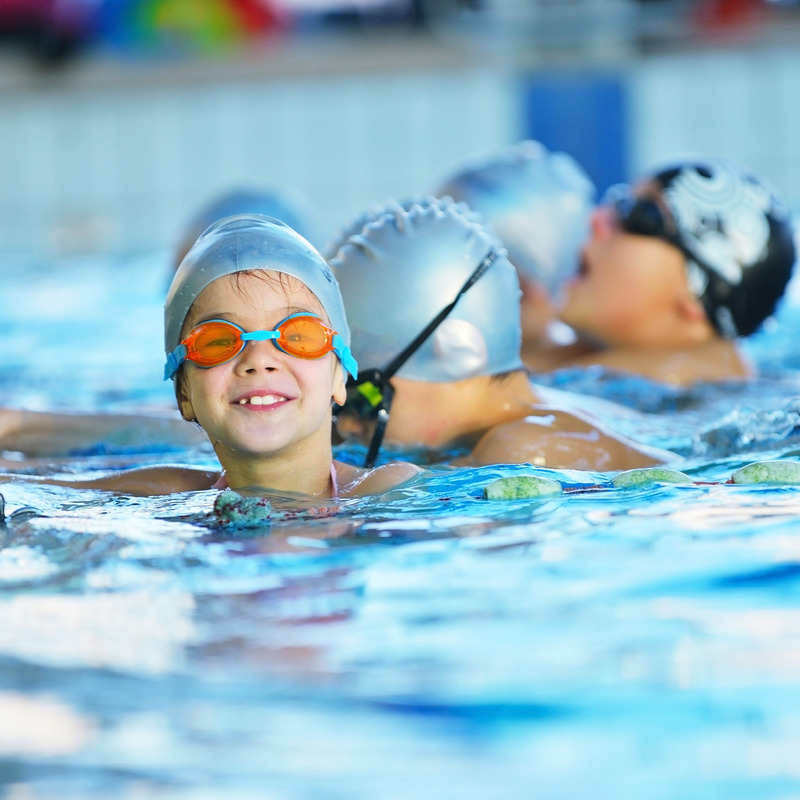 The class is designed for intermediate swimmers and will introduce different strokes and stroke refinement (ex: Freestyle and Breaststroke techniques, retrieving items from the pool floor, etc.). This class is offered in two-week sessions and each class 30 minutes long. The class is designed for advanced swimmers and focuses on swimming technique and a more in-depth stroke refinement (Ex: Drills designed to give the student practice in certain skills, kickboard drills, a more intense focus on technique rather than learning new skills). This class is offered in two-week sessions and each class 30 minutes long. This class is designed to teach students basic water safety as well as beginner swimming technique (EX: back float, front float, water kicks, flutter kicks, front glide, tread water, and basic strokes). Saturdays at 8 am for 8 weeks. Work cardio and strength with minimal impact on your joints. These in the water classes create a challenging and fun atmosphere. Shake up your routine, hit the water, and enjoy the variety. Aqua Barre– Fun, body toning and strength building water inspired workout featuring noodles as the barre. Aqua Power– Intensified water workout focusing on cardio and strength training. Aqua Balance and Cardio-Water inspired workout class where exercises are performed in cycles with underwater weights. Aqua Zumba-Aqua aerobics performed with an added Latin flavor. Only swim attire is allowed in the pool. NO COTTON. All swim trunks must have a liner. These guidelines are in place to protect our members and guests. We thank you in advance for your cooperation and support as a participant. *Monday – Friday from 10 AM – Noon, the pool is especially busy during the summer months. Please be aware of this as we often fill to capacity very quickly. Not A Member of The Salvation Army Kroc Center yet? We’d still love to have you visit our aquatics center! Non-members may have access to the pool area by purchasing a guest pass for a two-hour session. The price is $8 per person for each 2-hour session. 2-year-olds & younger are free but must wear a swim diaper and a plastic waterproof cover over the diaper. Additional sessions may be purchased to extend your time. Sessions are non-refundable and non-transferable unless the pool is closed by The Salvation Army Kroc Center. Purchase session passes by visiting The Salvation Army Kroc Center or online at www.krocmscoast.org. We encourage you to purchase passes in advance due to the possibility of selling out. Phone Purchases are not available. (There is a possibility of road construction in the area so give yourself some extra travel time) Sessions are non-refundable unless the pool is closed by The Salvation Army Kroc Center. No refunds… A swim credit may be given if you have 30 min or more left in your session time. Purchase Your Pool Pass online or in person at The Salvation Army Kroc Center. It is recommended you arrive 20 minutes before your scheduled session. Cost: $8 for each person, children ages 2 and under are free. April 29-September 2, seasonal rates are $10 per person.